The global e-commerce platform provider has seen a recent rekindling of enthusiasm for its shares. What: Stock in eBay Inc. (NASDAQ:EBAY) has gained 13.4% year to date through July 31, according to data from S&P Global Market Intelligence. The catalyst for the dramatic price spike? 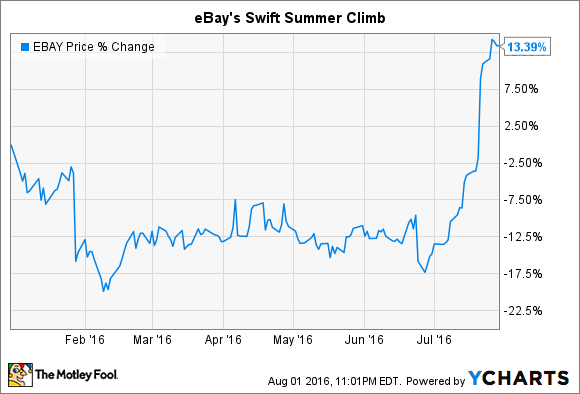 A second-quarter 2016 earnings report, released on July 20, which exceeded investor expectations and eBay's own guidance. eBay had projected Q2 2016 revenue of $2.14 billion to $2.19 billion, and earnings per diluted share (EPS) of $0.32 to $0.34. Actual revenue hit $2.23 billion, and the company recorded diluted EPS of $0.38. Adding to investor confidence, eBay also adjusted its full-year revenue outlook, from a previous range of $8.6 billion to $8.8 billion, to a new band of $8.85 billion to $8.95 billion. Management attributed the positive results to growth in both the core eBay platform and its StubHub business. eBay's gross merchandise volume, or GMV, increased 4% to $20.9 billion, while total revenue grew 6% to $2.2 billion. StubHub revenue increased to $225 million, at an impressive growth rate of 40%. The company's net income of $435 million represented a net profit margin of 19.5%. Now what: eBay's Q2 earnings were released almost a year to the day after it completed a spin-off of former division PayPal Holdings Inc. (NASDAQ:PYPL). PayPal's growth prospects were never in question before the split -- the transaction giant just reported a revenue jump of 15% in its own second quarter of 2016. But observers have wondered how eBay might prosper without the benefit of its powerful payments arm. So far the answer seems to lie in promoting non-marketplace services. While the marketplace segment still accounts for the majority of total company net revenue, eBay's two other major revenue streams, StubHub and marketing services, play a bigger role in revenue composition each quarter. They contributed roughly 10% and 22% of total net revenue in Q2, respectively. eBay intends to push these smaller value drivers going forward. In March, the company acquired Spanish online ticket marketplace TicketBis for $165 million, and last month, it scooped up ticket inventory specialist Ticket Utils for an undisclosed sum. In addition to these StubHub purchases, eBay is acquiring tech companies Expertmaker and SalesPredict, to bolster its machine learning and artificial intelligence initiatives, as well as to enhance structured data to improve listings. In essence, since the PayPal spin-off, investors may be warming to the idea of eBay as a mature, retail technology company with several available avenues to future growth. For the rest of 2016 and into next year, shareholders may want to follow growth in the non-marketplace revenue streams, to ensure that this narrative continues to play out.